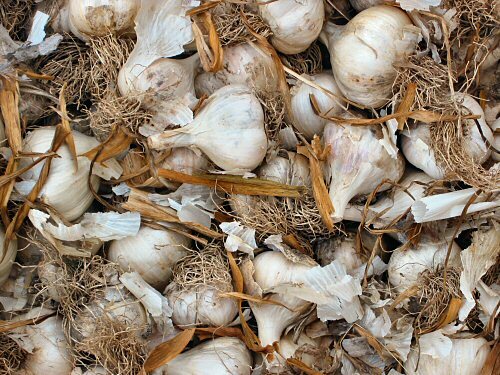 It’s never too early to make sure you have enough garlic to seed next year’s crop. Local garlic is kind of a cult item, people who want it get quite intense about stocking up, whether for winter or to finally take a shot at growing their own. And it’s somehow hard to resist selling your every last bulb… It’s not a money thing, because it costs me just about exactly what I make to buy back the same quantity, it’s that people seem so happy to have gotten some. I’ve chatted with independent garlic growers small and large, and overselling your stock seems to be quite common. As a bonus to saving rather than buying every season, selecting the best bulbs as seed garlic from your own harvest may eventually result in an improved strain for your particular plot (the way garlic reproduces via vegetative cloning, I’m not sure what genetic science says about this as an improvement strategy, but it certainly can’t hurt!). we are marketer/agent for company who are willing to buy products like garlic,ginger and so on.we would like to work with your company as a representative for sales of your products. we would be glad to hear from you as soon as possible. I have Garlic with red scheelds organic. yes I want to buy .what is your price per 1kg. i am able to grow from 2 to 200 acres gourmet garlic is there a market? Im wondering how much Garlic actually sells online. I am a garlic farmer(grower) in South Africa. How big is your demand? Is it weekly, monthly? How do you want it packed? What is the delivery adress?What was your last price, how do you pay? I am a small home gardener, with less than 25 acres. I would like to sample as many of the 10 class of garlic, so I can find out what I like best. So I need small amounts of large varieties as possible. Do you have seed garlic for sale? If not, do you have a possible supplier for a small quantity (about 1000 ) of seeds? Garlic seed is available at select nurseries around Gauteng. It is a seasonal crop to be planted in autumn. We have garlic that will grow in all different grow zones in the USA. Hi please give me a price of your garlic per kg in bulk . were r uwhats your price per 1kg. Where can I buy SA garlic. This rubbish from China has no taste! im looking for a garlic farmer, that can supply me with top quality garlic boxs and bags. I have garlic in Ukraine for whole sale. If somebody interested in it, please feel free to contact me. After reading many blogs, questions and comments, I would like to add my penny’s worth……..
SMALL, Little, Pink Egyptians are THE best ……. In a potjie, stew, or with mince and (sheba) in pasta…. Man oh man. The skin adds to the flavor…the fruit is tasty as heaven… If you’re gonna chew on the bone, Stew/Potjie you can chew on the skin and put it on a plate after sucking out the fruit…. Seriously though..not many people know the little pinks… and go after the big giants……….that are not always as tasty. Ask a (smoker), (drinker), with no palate…lol. It’s great. I only got 52 clove in this year. i would like to export garlic from ethipia to usa.any body interested? whose interested in buying South African grown garlic? Where are you situated? What garlic [name] do you grow? What quantities would you be able to supply? On top of that we deliver in large quantities too, meaning you can get yourself sorted for a while before repurchasing (miminum 28 tons). And you need not worry about delivery, it is almost negligible.? I have white garlic with red scheelds organic. I am from Bosnia and Hercegovina. Hi, Walden Farm in Fouriesburg will be harvesting this years crop around October and we are looking for bulk buyers. We have both Egyptian Pink and Giant White available. Hi, I’m a garlic farmer in south Africa. I’m ready to sell. Please tell me what’s the best prices I can get. I like to buy for personal use .what is price for 2 bags n you weight. I have 2 year old garlic growing wild in an old plot. I have garlic coming off the land now. Grown in the Klein Karoo. Pink skin. I want red garlic or purple….